Bihar Vidhan Sabha Recruitment 2018 - Apply Online for 56 Steno, Personal Asstt & Reporter Posts in Bihar Vidhan Sabha, Bihar, Patna. Online Applications are invited by Bihar Legislative Assembly from 16 Oct 2018 11:00 AM to 08 Nov 2018 til 05:00 PM for 56 vacancies. Bihar Vidhan Sabha Stenographer Admit Card 2019: Bihar Legislative Assembly has issued the Admit Card on 11 Feb 2019 for Bihar Legislative Assembly Stenographer Exam 2019. 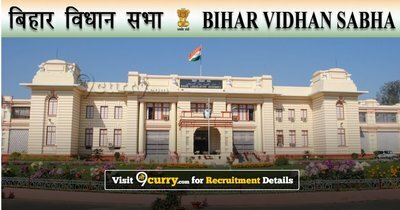 Eligible candidates may apply online at Bihar Vidhan Sabha's website (direct link is given below) from 16 Oct 2018 11:00 AM to 08 Nov 2018 05:00 PM. Candidates log on to https://blas.online-ap1.com/. Click on "New Candidate Register Now", if you are a new user.